The “Una Mano Amiga” organization is hosting a Free Three-Day event, featuring live musical performances and special guest speakers. The event will also have donation booths set up for both school supplies for local children, and supplies/clothing for local flood victims. 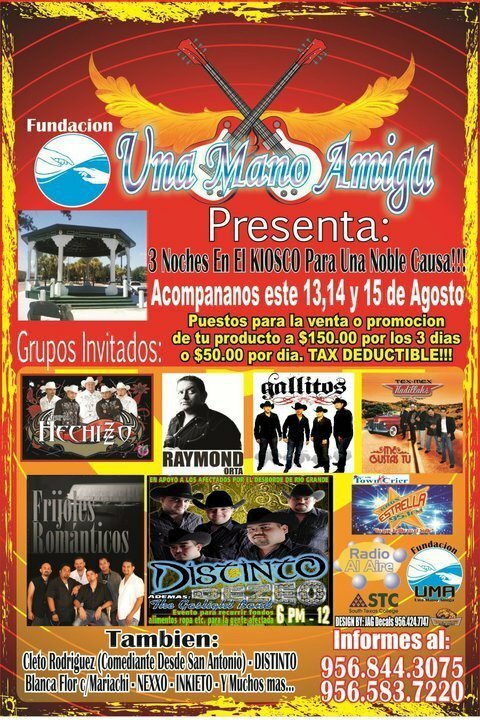 The festivities will take place at the KIOSK located in Down-Town Rio Grande City, from August 13 – 15. Event organizers encourage the entire community to be a part of the activities, and/or volunteer to help with arrangements. For more information about this event call 956-583-7227 or 956-844-1974.